In the port town of Bergen, Norway, there exists possibly the most interesting little museum I’ve ever visited. I’m not talking large scale Gehry-designed masterpieces here (though lord knows they make me swoon). I’m talking small, unique, quirky little places which really give you a glimpse into the life and culture of a place – and this little wonder certainly wins the prize for me. 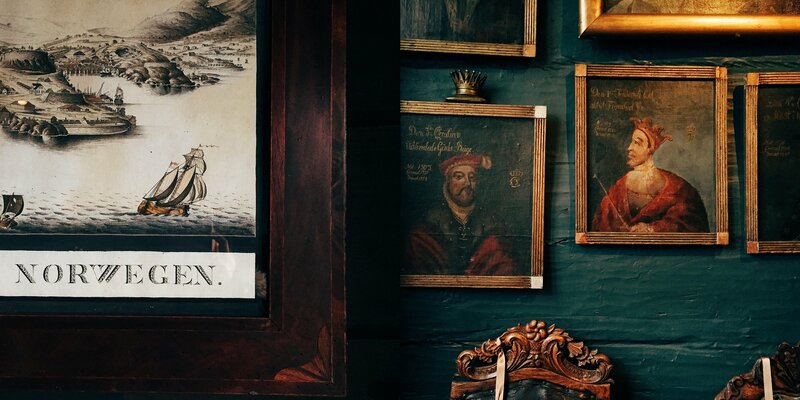 The Hanseatic Museum is the very faithfully preserved interior of one of the many merchant houses that spanned Bryggen in Bergen, this particular one being from 1704. It’s where the German workers of the Hanseatic League lived, worked and traded, and is a beautiful and fascinating insight into the past. The Hansas dominated the trading scene for over 400 years, controlling all incoming and outgoing trade in this port town – which was substantial. Happily, it’s also a UNESCO World Heritage site, which means it will continue to be protected and preserved for a very long time to come. The house is permeated with the smell of the dried fish hung throughout the building (no doubt for authenticity’s sake!) and the rooms are kept fairly dark, lit only by the barest of bulbs or by the grey skies outside, their watery light cast through the warped window panes. It’s an ever-so-slightly eerie place, which at times forces you to hold on to the walls as you peek around a corner, waiting for your eyes to adjust to the darkness. But this is how life was back then, and it’s so nice to experience it as it was, and not all brightly lit and glass-covered. On the day we visited, I had decided to leave my 5D at home. It was so nice to wander around as a regular tourist, and not be lugging my camera gear around all day. So I happily feasted with my eyes, taking a few iPhone images along the way which captured the mood of the home perfectly – which just goes to prove that the best camera really is always the one that you have on you. Wonderful post, as usual! Your photos really capture the coziness of the museum, and I love the interplay between the warm lamplight and the deep green of the walls. Do you have any tips for editing iPhone photos? What apps/programs do you use? (Please forgive if you’ve answered this question before) Also I adore museums that capture the every-day life of people in history, so this sounds like a dream! Norway is definitely on my travel bucket list now! Hi Laura, sorry for the (very) late reply, my blog has been a bit neglected as of late! Editing wise I use Priime, VSCO Cam and Snapseed for editing, and Touch Retouch for getting rid of unwanted elements in images. Norway was wonderful I’d absolutely recommend it! Maybe a little more than 4 days though, it really wasn’t enough!